*Post brought to you by Ten Speed Press. A few months after going vegan I discovered the YouTube channel hot for food. 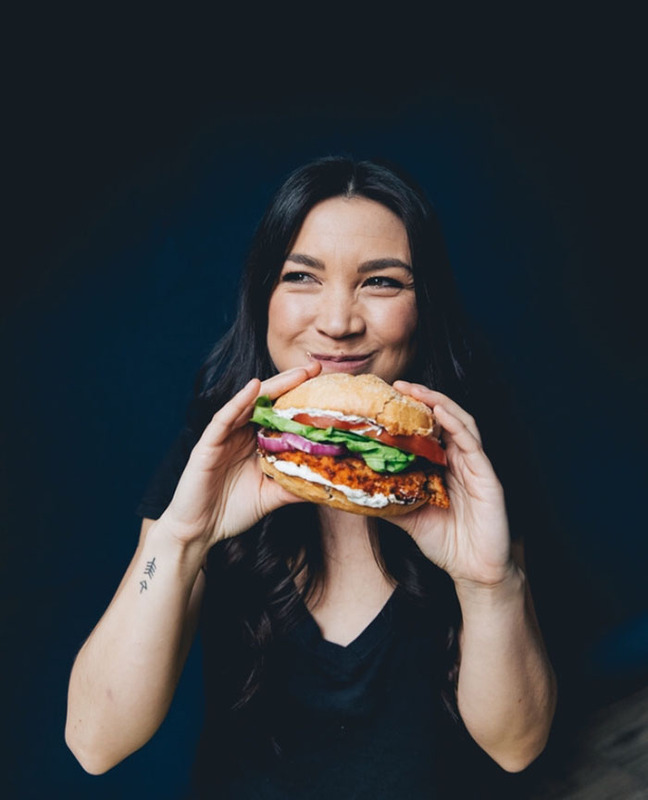 hot for food is a channel run by the uber-talented Lauren Toyota, a former MTV Canada host. Whether or not you are vegan, her channel is entertaining and informative (I know because I binge-watched her videos when I stumbled across her channel). The best part, however, is that her recipes work. And they’re delicious. Lauren just came out with her first cookbook, Hot for Food Vegan Comfort Classics, and I’ve spent the past few weeks cooking from it. The book has 101 recipes that definitely fit the comfort food label, the book is full of Lauren’s personality so it’s a fun read, and everything I’ve made from it has been perfection. When I was trying to decide what to share with you I kept coming back to her Southwest Chop Salad. There were so many other amazing things to choose from, like her Oyster Mushroom Po’ Boy, her Chicken Potpie Soup, or her Apple Fritters. But I am all about that Southwest Chop Salad. And here’s why. Most of the components can be prepped ahead of time, at your convenience. So when it’s time to eat it’s just a matter of pulling everything out and putting it into a salad bowl and stuffing your face. It’s fresh and colorful, so you also get to eat with your eyes first. It also tastes AMAZING. A few of the components really take it to the next level. One of the components is worth the price of the book alone: Coconut Bacon. 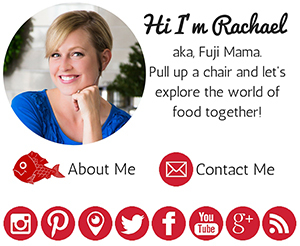 Lauren provides 5 different bacon recipes: coconut bacon, almond bacon, tofu bacon crumbles or slices, mushroom bacon, and cassava bacon. Each bacon has a bit of a different texture and flavor, making it easy to find a bacon that is perfectly suited to the dish it’s being used in, and also providing a great way for you to find one (or two…or more) that you love. For this salad though, the recipe calls for coconut bacon. It’s crazy easy to make and makes quite a bit, which ended up being a really good thing since the salad was so good that I had to make several batches so that I could eat it for lunch several days in a row. It was also a good thing because I keep finding little hands sneaking in to grab some as a snack. To make the bacon all you do is quickly whisk together a marinade which you then pour over unsweetened coconut flakes, then bake in the oven until the flakes are a deep brown color. 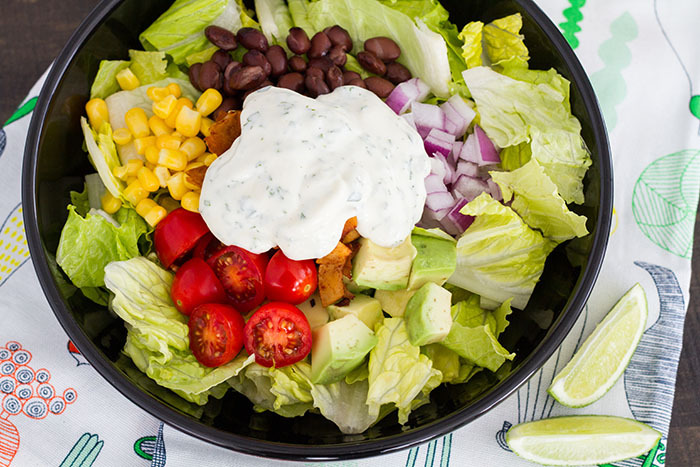 The other component that makes this salad really special is the Classic Ranch dressing. It uses fresh herbs and the flavors really pop. You can make it and keep it in the refrigerator for up to 10 days, so you really have no excuse for not having enough time to make salad dressing from scratch. Everything else that needs to be done to make this salad are things like rinsing beans and chopping lettuce. Most of those things can be done ahead of time too, which makes this a fantastic dish to serve as part of a meal if you have guests coming over. Plus, it’s a crowd-pleaser, unless you have guests that don’t like good food, then you’re just out of luck. You need to make this salad ASAP and then you’ll realize how much you need to own your own copy of the book so that you can have all the rest of the recipes. 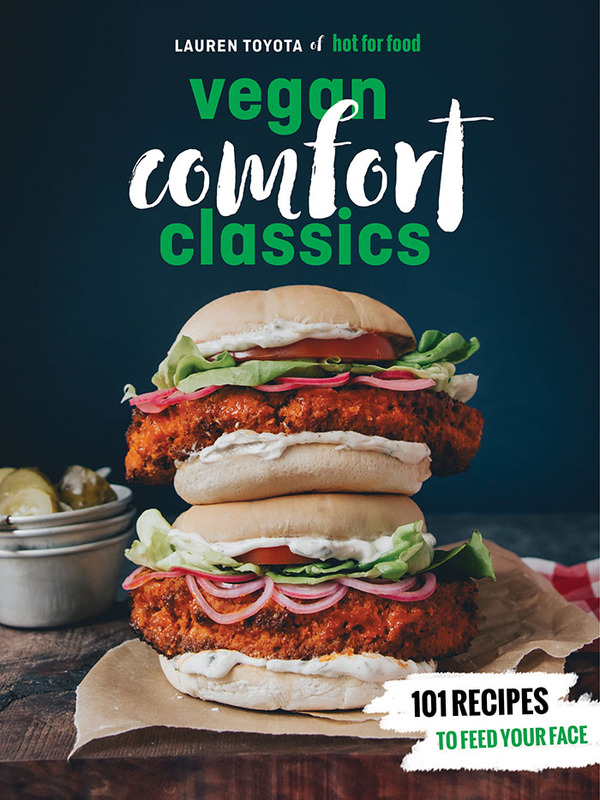 Reprinted with permission from Hot for Food Vegan Comfort Classics, text and photography copyright 2018 by Lauren Toyota. 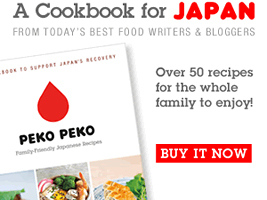 Published by Ten Speed Press, an imprint of Penguin Random House LLC. This is a fast and fresh salad from Lauren Toyota's new cookbook, Vegan Comfort Classics. Lauren says that she usually preps all the components ahead of time and stores everything separately so that she is ready for quick assembly throughout the week. 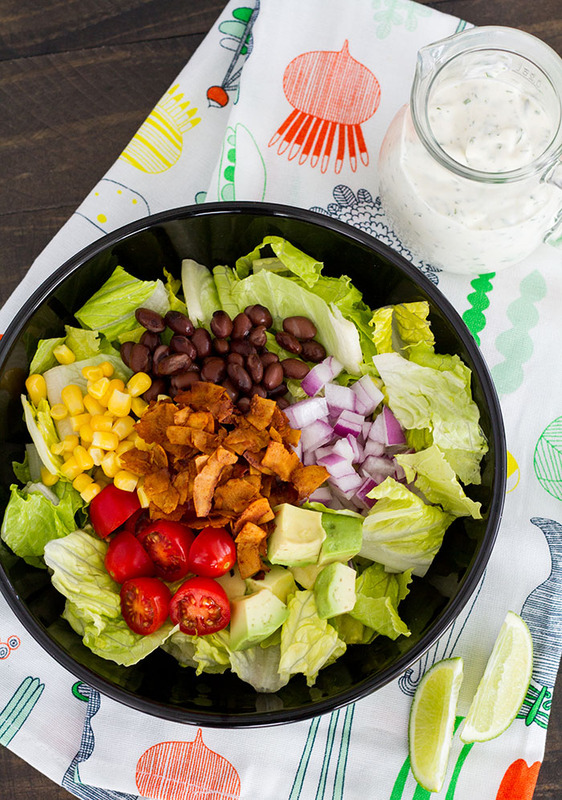 She notes that this salad also "gifts you with the makings of a pretty nice veggie taco too!" Combine the soy sauce, maple syrup, liquid smoke, and smoked paprika together in a bowl or wide dish with a whisk or fork. Stir the coconut flakes into the marinade and coat well. There shouldn't be any marinade pooling at the bottom of the bowl, as the flakes will soak it up. If there is, keep stirring until it disappears! Line a baking sheet with parchment paper. 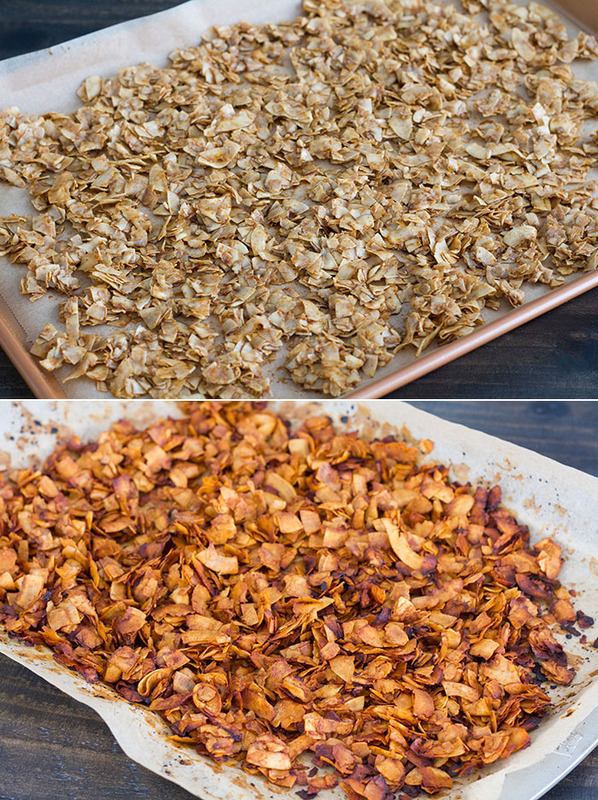 Spread out the coconut flakes on the lined baking sheet in an even layer. Bake for 20 to 25 minutes, tossing every 5 minutes to prevent burning. 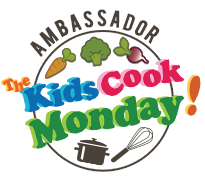 When the coconut is a uniform, deep brown color, remove the baking sheet from the oven and transfer the bacon to a plate or another baking sheet so it doesn't continue to cook. Allow it to cool completely before storing in an airtight container. The bacon will last 2 months if stored in a cool, dry place, but it never lasts that long in my house. Stir all the ingredients together in a bowl until well combined. Add water if you want a thinner dressing. Store in the fridge for up to 10 days. 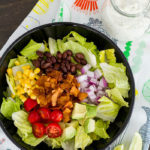 Assemble each salad with 2 cups of the chopped romaine, 1/4 cup of the diced onion, and 1/2 cup each of the corn, beans, and tomatoes, plus one-fourth of the avocado. Top with the bacon and ranch dressing. Feel free to go wild on those two things too! HOT TIP: Wanna make this salad warm? Saute the black beans, corn, and red onion together with the spices of your choice, and leave the rest of the ingredients raw and fresh. Ummm, also taco worthy! *Disclosure: Ten Speed Press sent me a review copy of the Hot for Food Vegan Comfort Classics cookbook at no cost to me. All experiences and opinions are my own. This is delicious. I love the coconut bacon. Never thought of cooking bacon this way. The coconut bacon is sublime!!! That coconut bacon is downright divine, as is the ranch. 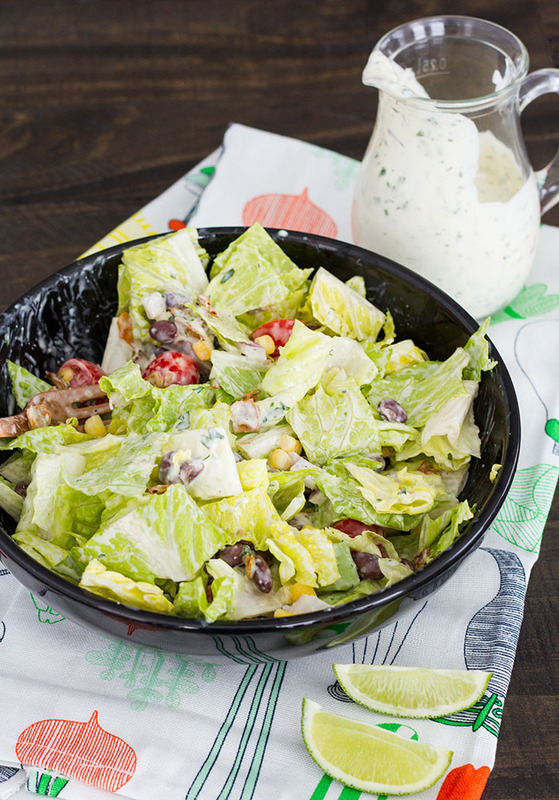 Together they elevate a chop salad to a whole new level. I’m so glad you got to eat it with me!! I made this myself tonight for the two of us–easy and fantastic. We think we could eat it several times a week. I think it is my new favorite salad. I made this today for lunch, but substituted butter lettuce…it was amazing. I will be making it over and over again. I’ve already ordered a copy of the book. Thank you so much for posting about it!